More history! This area swims in it. 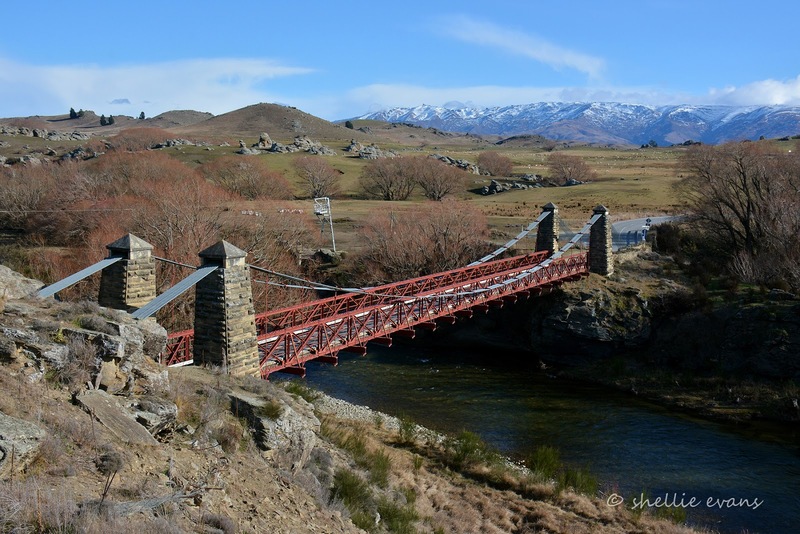 The Daniel O’Connell Bridge (1880) crosses the Manuherikia River just down the road from where we are in Omakau. 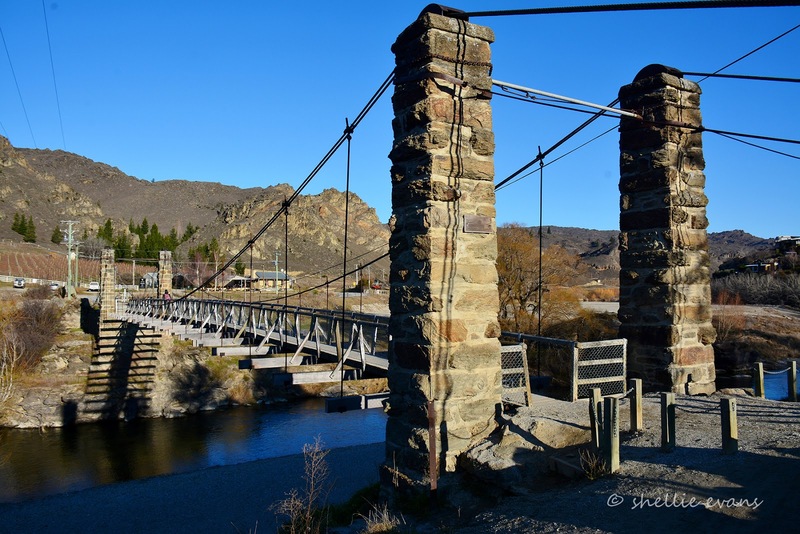 The single lane wooden bridge is one of the last surviving suspension bridges in Central Otago. 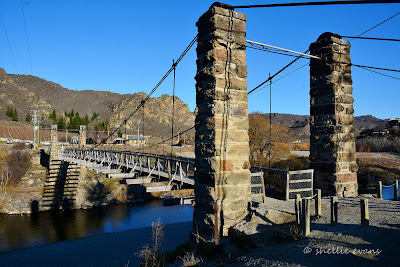 The bridge is part of a loop road off the main highway which passes through the tiny historic settlement of Ophir. The town sprang into life overnight when gold was discovered on the property of a local runholder, Charles Black in 1863. In less than 3 months thousands of miners occupied what became known as Blacks Diggings. 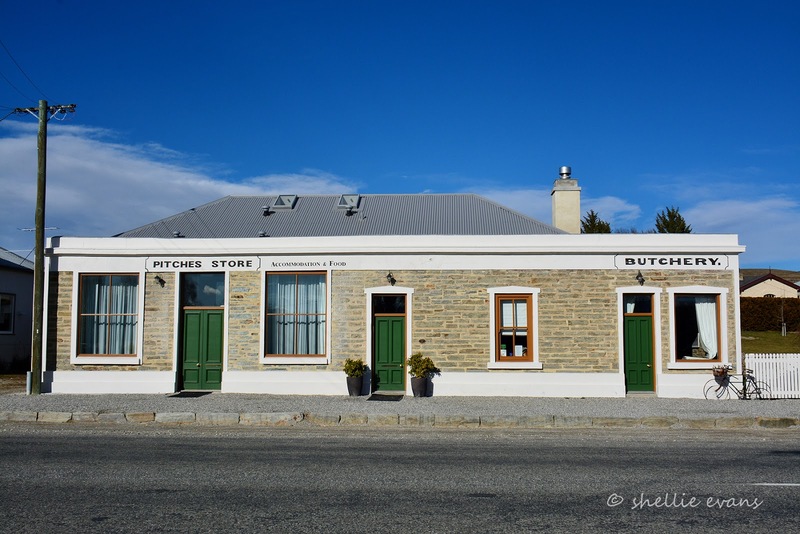 It was shortened to Blacks – a name that remained with the school and the hotel in spite of an official name change to Ophir in 1875. 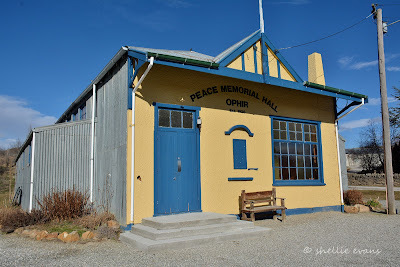 In its heyday, Ophir was the commercial & social centre for the district but when the gold ran out so did the population. 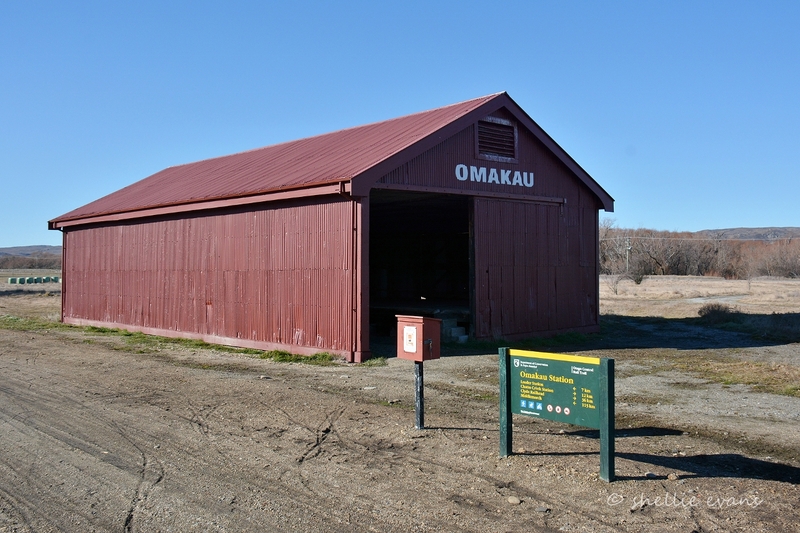 The final blow came in 1904 when the railway line by-passed the town in favour of the farming community at Omakau just across the river. 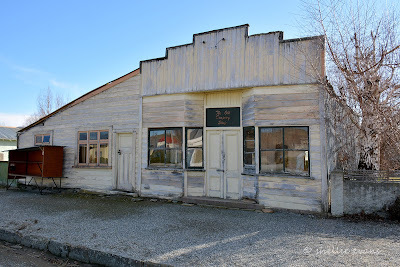 Ophir sank into obscurity which probably helped save many of its historic buildings. 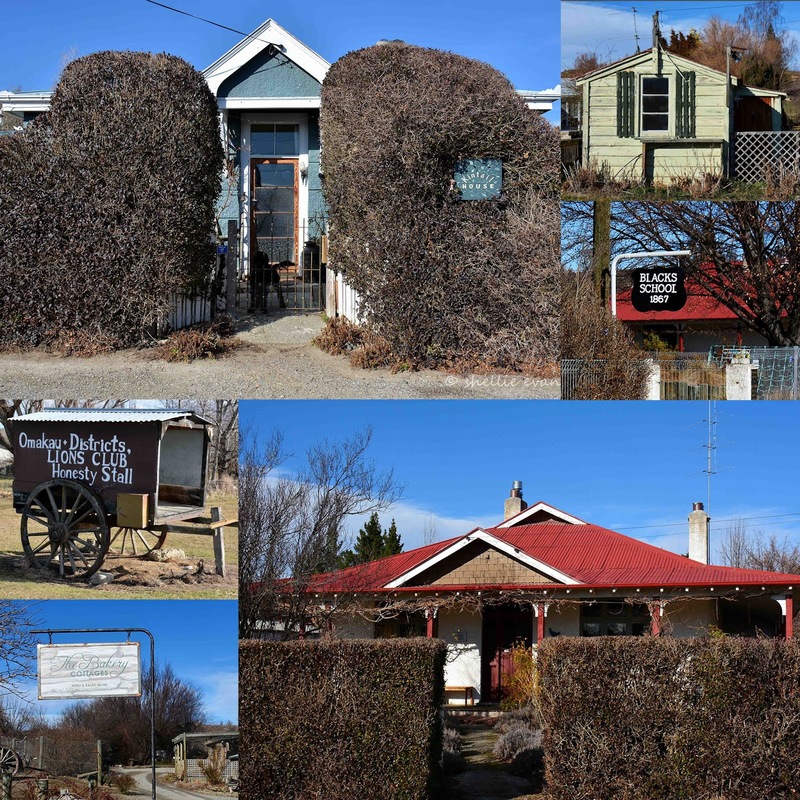 Nowadays the village has become popular again, with tourists, many from the Rail Trail, keen to sample the towns history and stay at the accommodation houses dotted along the main street. A main street that hides its charms well. Ophir Peace Memorial Hall (1926) - has an excellent dance floor and is still used for many functions and events. Ophir Post Office (1886) - it still operates as a post office agency for between 9am and noon each day. Ophir Jail (1900) - This small wooden 2 cell jail was located beside the policeman’s house. 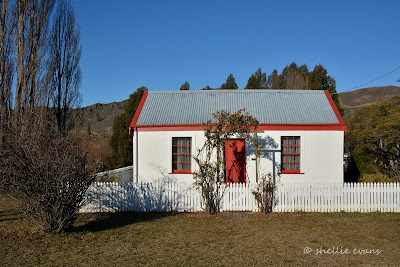 After a new police station was built in Omakau in the late 1940s the jail was no longer used. 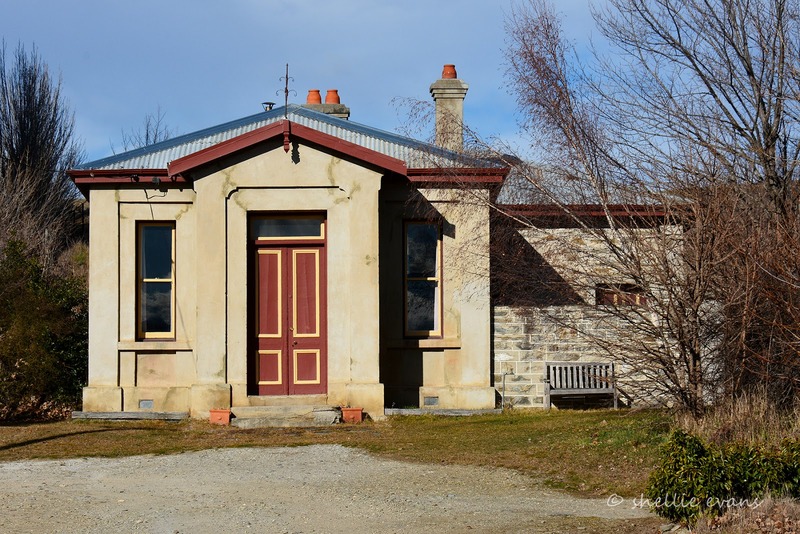 It was shifted off site and became a sleep-out in Omakau before being returned and restored. The Courthouse (1884) – the building reflects the optimism that Ophir would remain a town long after the gold ran out. The design is the same as the Alexandra and Clyde courthouses. The Old Drapery was both shop and living quarters. 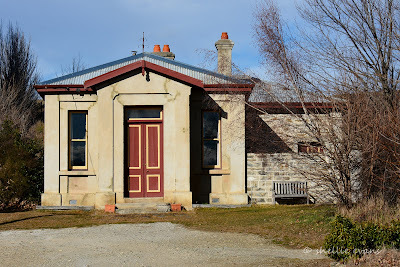 The Cottage Hospital was most likely both the hospital and doctor’s residence. 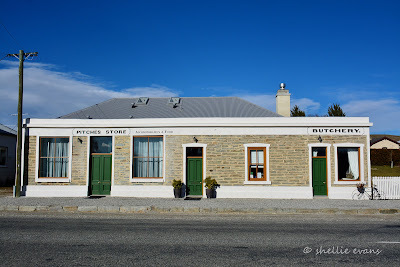 This large stone building was originally a grocery store at one end and a butchers shop at the other with the owner living in the residential part at the back. The buildings roof and front were altered in the 1960s when it became a service station. In 2011 it underwent a complete restoration and is now a restaurant and offers accommodation. The Bank (1886) - at one stage Ophir had two banks but only one has survived. The former Bank of New South Wales building has been substantially modified since its conversion to a private home. 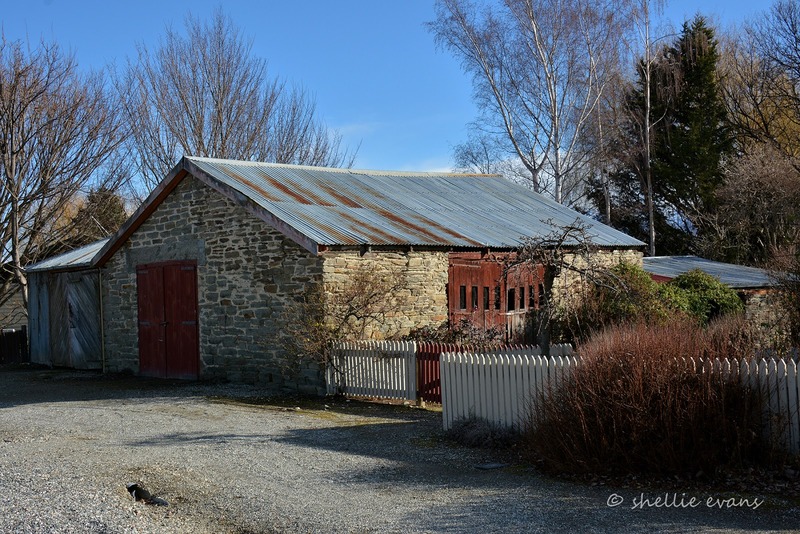 Stone Barn with a iron lean-to and a two-stall stable behind. 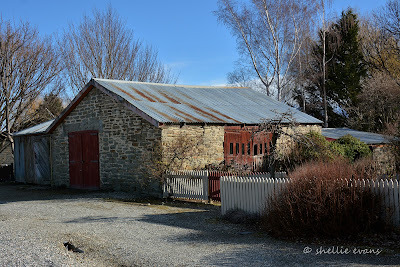 In early times, various horse drawn vehicles were built in the barn by the McKnight brothers and it was also used as a smithy. 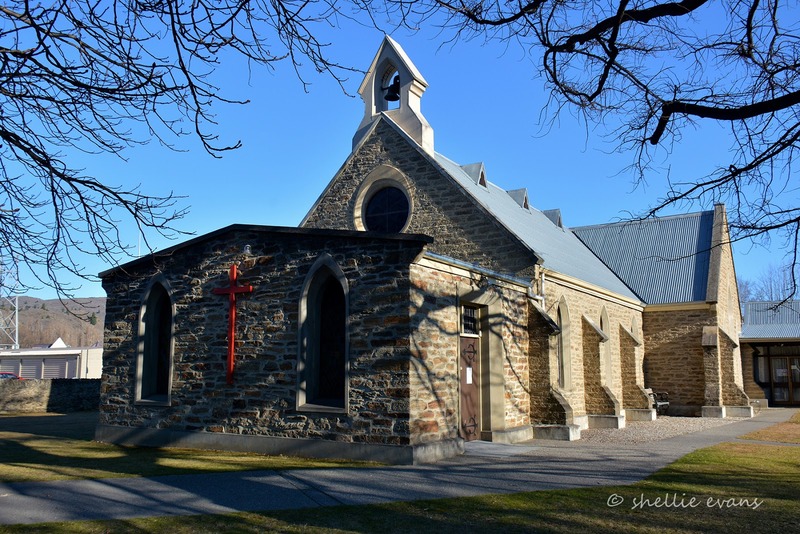 Union Church (aka St Andrews Predbyterian Church), a simple gothic church opened for worship in 1897 and closed in 2008. It is now in private ownership. More buildings from Ophir’s main street- top left, the Policeman’s House & Station (1870s), which is next door to the Courthouse. Larson House (middle left) which is actually two, two roomed cottages, one placed in front of the other and bottom left is McKnights Cottage (c1904), John Mcknight was a local builder, a blacksmith, funeral director & county councillor. 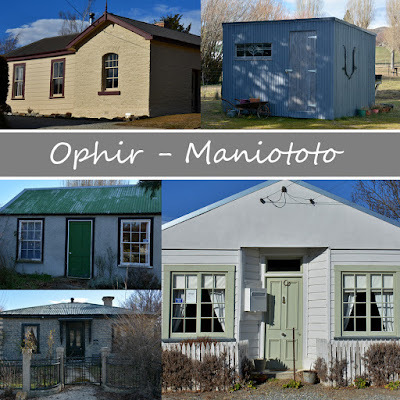 He built many of the Ophir’s buildings and also built the Bank of New Zealand building in Omakau. A jack of all trades! 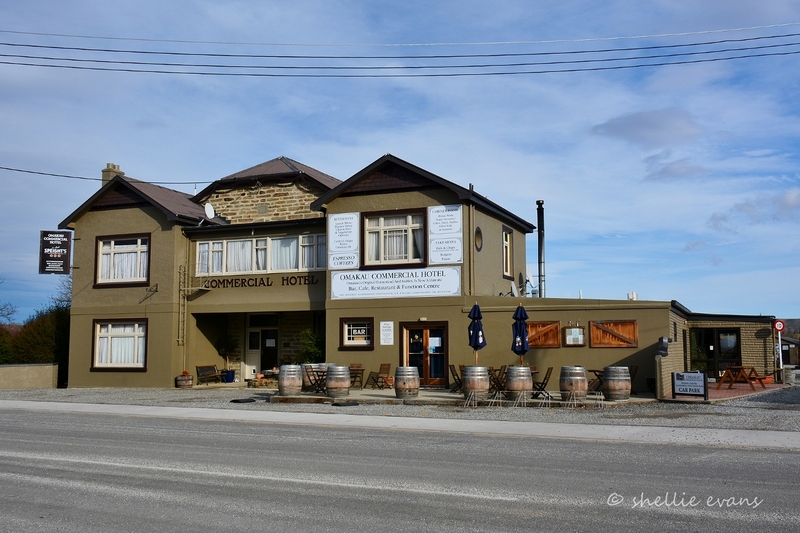 Blacks Hotel (1937) - located at the end of the town, or the beginning depending which way you come, is the art deco style Blacks Hotel. It was established when a new bridge crossing the river to Omakau was built and what was known as the Ophir lane became a highway. 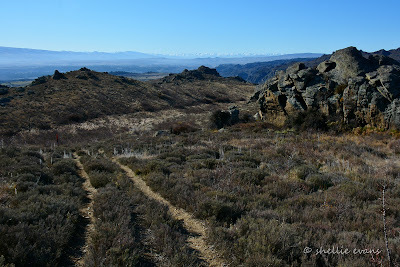 That ‘highway’ carries on over the Raggedy Range and into the Ida Valley. 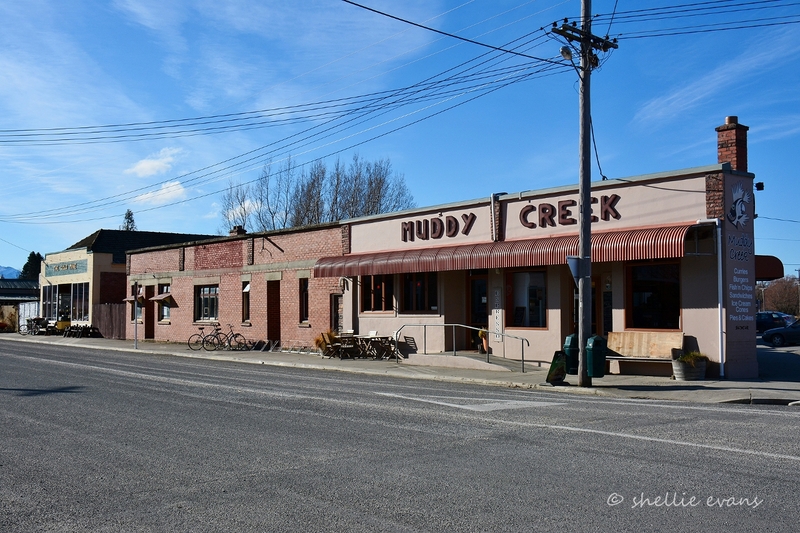 Behind the hotel are lovely accommodation units (looking like a shearing gang shed) for rail trail cyclists. MacTavish’s Hut- a short distance up the ‘highway’ is a restored miner’s hut. 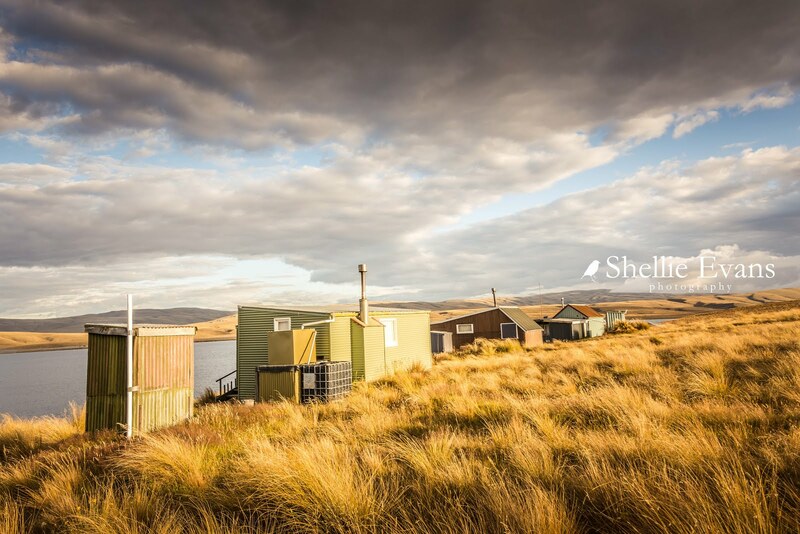 The two-roomed hut was built on an acre of mining land owned by Lockhart McTavish. 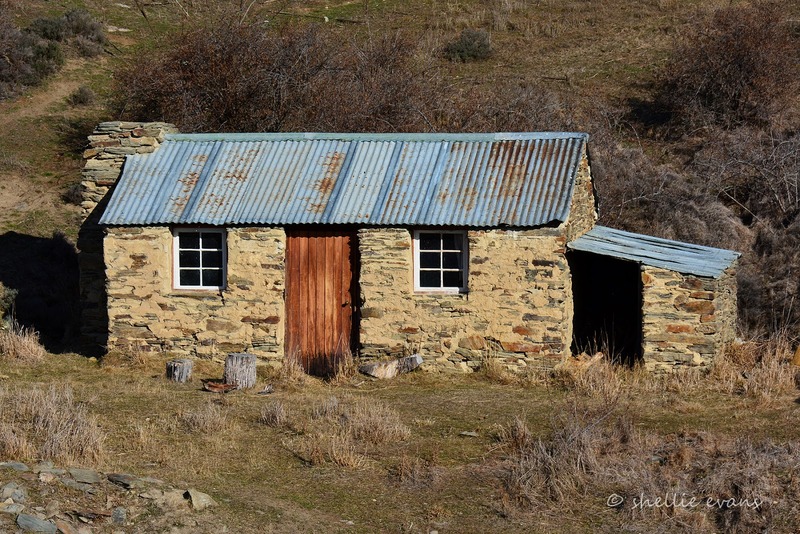 At one stage the hut was occupied by Clem Daniels, a goldminer who ended his days there at an advanced age. Clem was well known in Ophir, he dressed in a blue suit whenever he walked to town, he also umpired many cricket games, marking the number of balls bowled with his walking stick. It was always obvious when he found gold- he would hold a roaring celebration at the old pub. 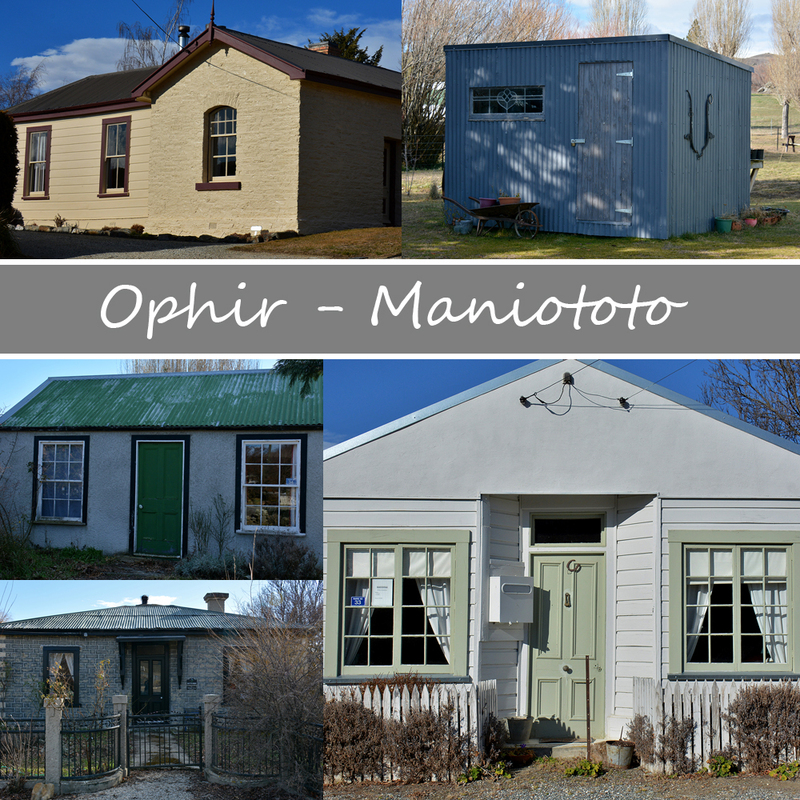 I hope you enjoyed your ‘wander’ around Ophir. Many thanks to “Promote Dunstan” for their informative brochure. 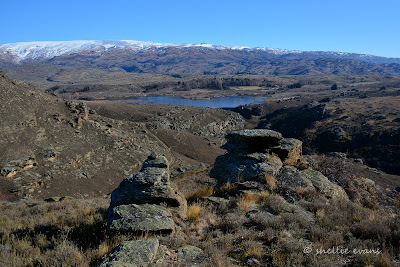 We’re spending the next couple of weeks or so exploring the famed Maniototo area in Central Otago, an area known for it’s weather extremes, from one of the hottest places in New Zealand during the summer, often over 35c, to the coldest in winter where temperatures have been recorded as low as -21c. 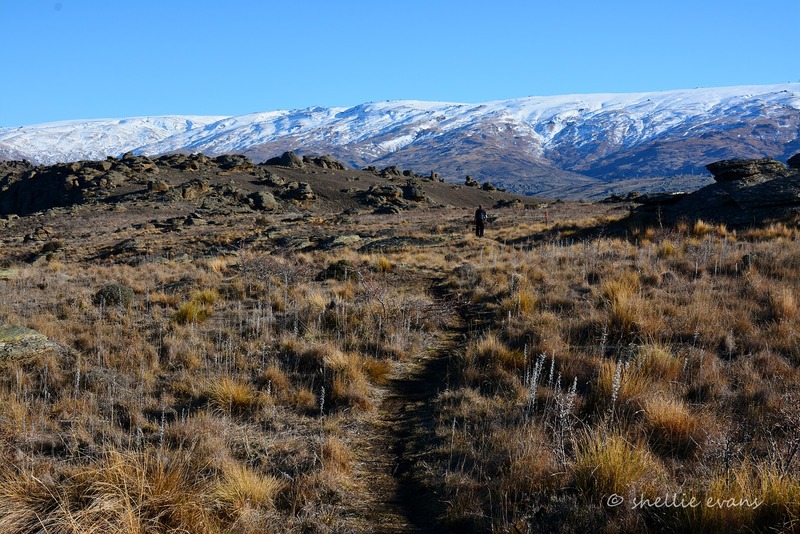 The Maniototo is not only known for it’s vast tussock covered plains, rugged mountain ranges and big skies, it’s also known for it’s hoar frosts and I’m hoping to catch one to photograph on our way through. Although that now looks highly unlikely as so far we’ve experienced the warmest temperatures we’ve had all winter. And after speaking to the locals they’ve told me the last hoar frost was two winters ago. They told me this after cursing at me for wanting a frost. It’s the last thing on earth they’re looking for; the water pipes stay frozen for weeks on end, they can’t do any work, the stock suffer, on and on they went. Yes, they definitely don’t want a hoar frost thankyou very much! Our first stop after leaving Alexandra was at the historic Chatto Creek Hotel just 15kms up SH85. 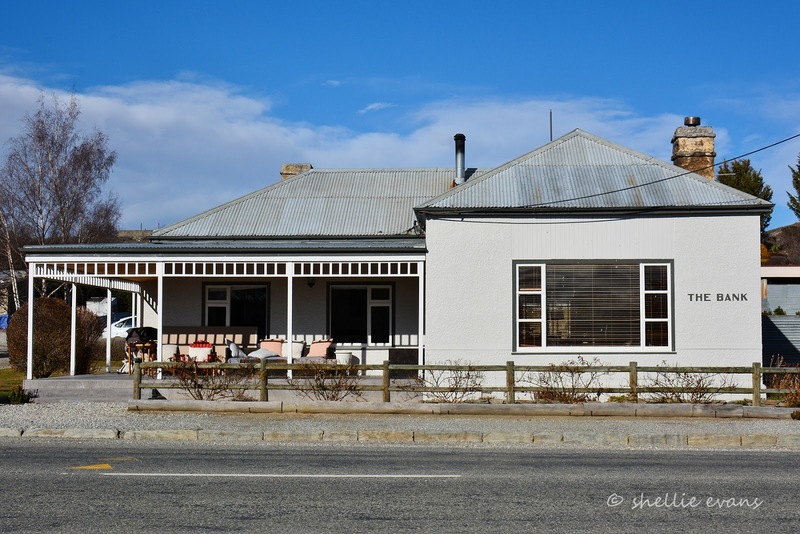 The hotel was built in 1886 and while it has been added on to over the years, the original structure is mud-brick. 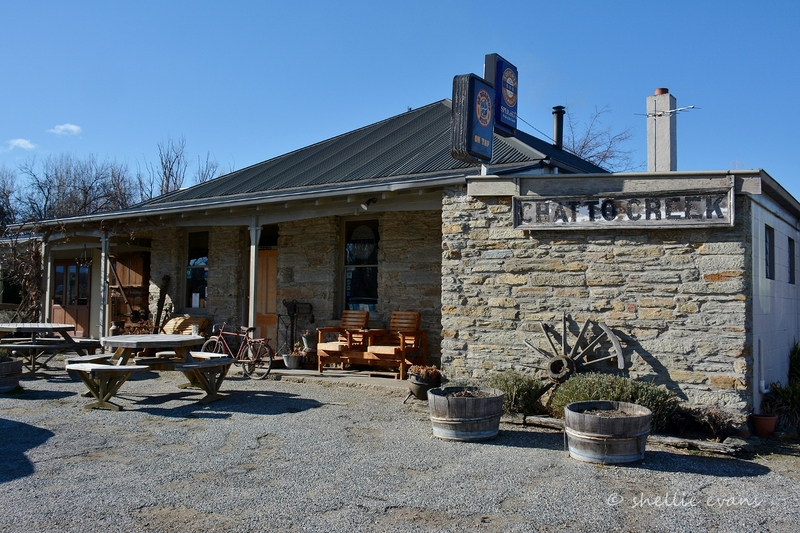 In the late 1890s when Chatto Creek was a booming town the hotel was popular with rabbiters working on the early sheep stations. 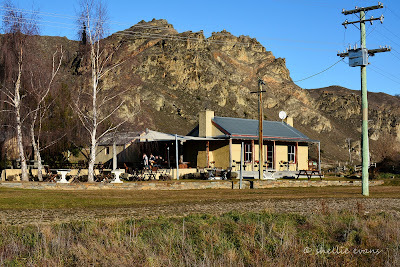 Nowadays it’s a popular place to call in for lunch or dinner at the weekends, and during the cycling season it’s a very busy place as the Otago Rail Trail crosses the main road just past the hotel. 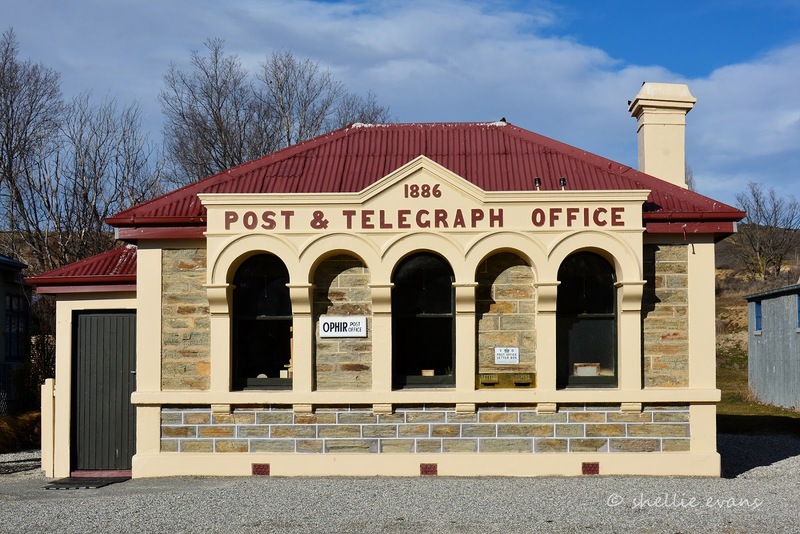 The original Chatto Creek post office, which opened in 1896, was a tent plastered with newspapers for insulation. It was replaced by a public works hut in 1933 and closed in 1975. 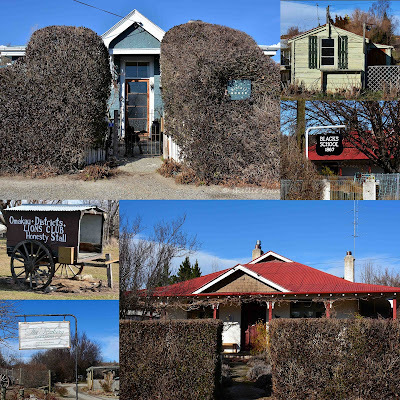 The hut was shifted to Alexandra but brought back to Chatto Creek in 2004, restored and now sits beside the hotel. 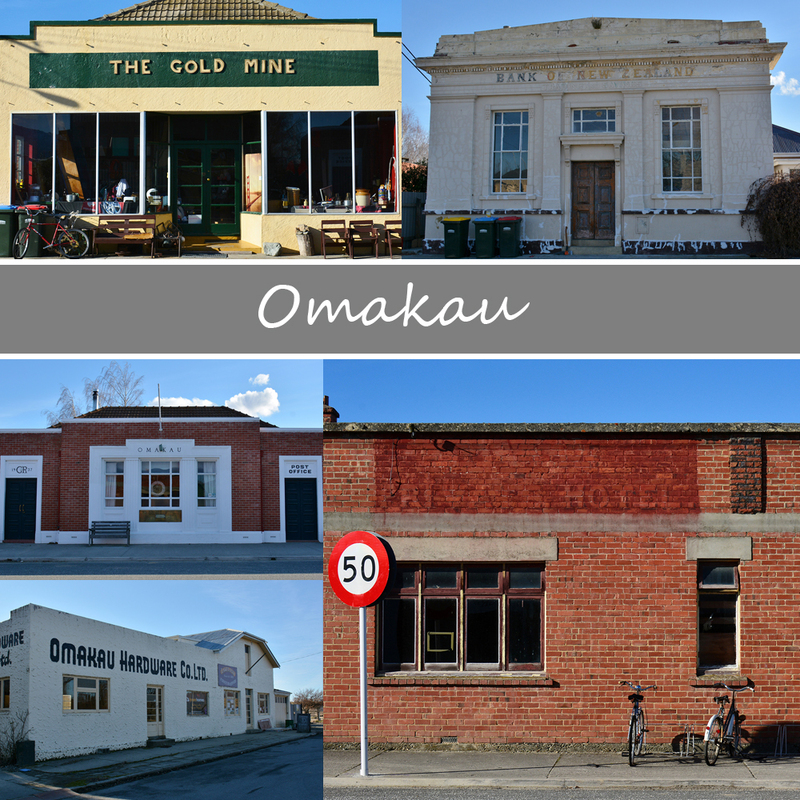 Our next stop over is Omakau, a small farming town on the main road and the first overnight stop for most people riding the 4 day Otago Rail Trail. 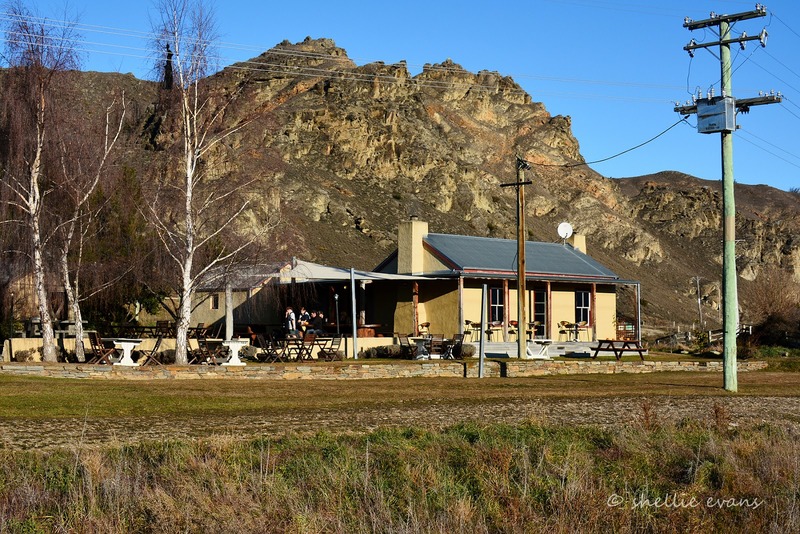 The 150km rail trail, which starts in Clyde and ends in Middlemarch (or visa-versa) has been the savior of the isolated Maniototo where farming is the main stay. 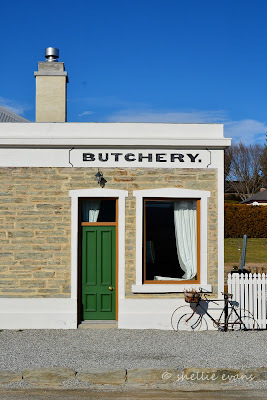 Once the railway line was closed many of the settlements along the route disappeared, others now only survive because of the accommodation and food they provide to passing cyclists. 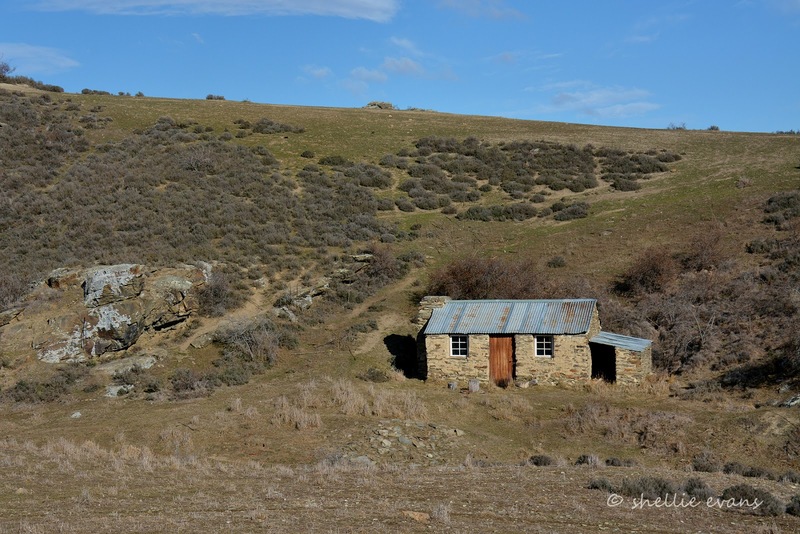 And even though the Otago Rail Trail is now 15 years old, was the first and is the most popular of NZ's cycle trails, some settlements are still just hanging on by a thread. There are very few cyclists during the winter months and most accommodation places close during the off season between May and October. 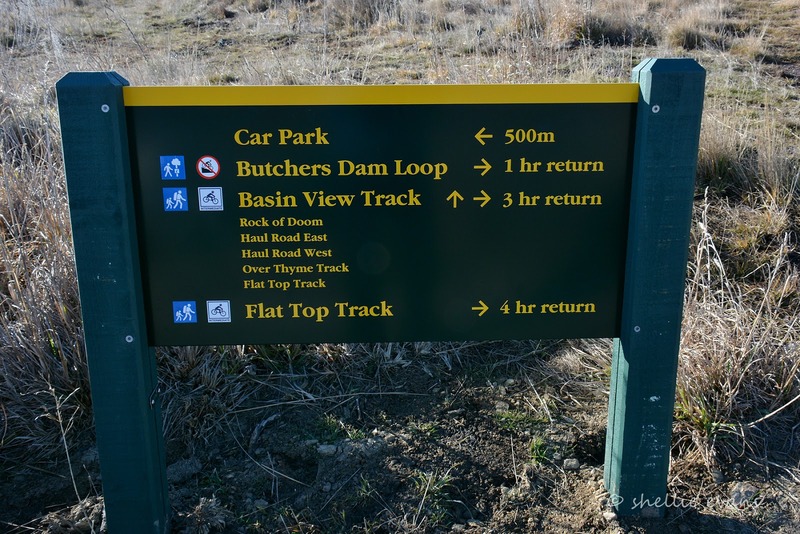 The old rail goods sheds along the trail have been restored and it’s here that trail riders can self stamp there Rail Trail ‘passports’. We’ve been parked up behind the Omakau Commercial Hotel for the last few nights, they have a few hard stands with power available. 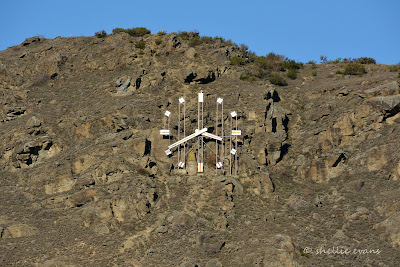 Although, as we’ve now found out, they turn the power off to the sites over winter. Luckily we are self-sufficient so they have allowed us to use the site as a POP (Park Over Property). 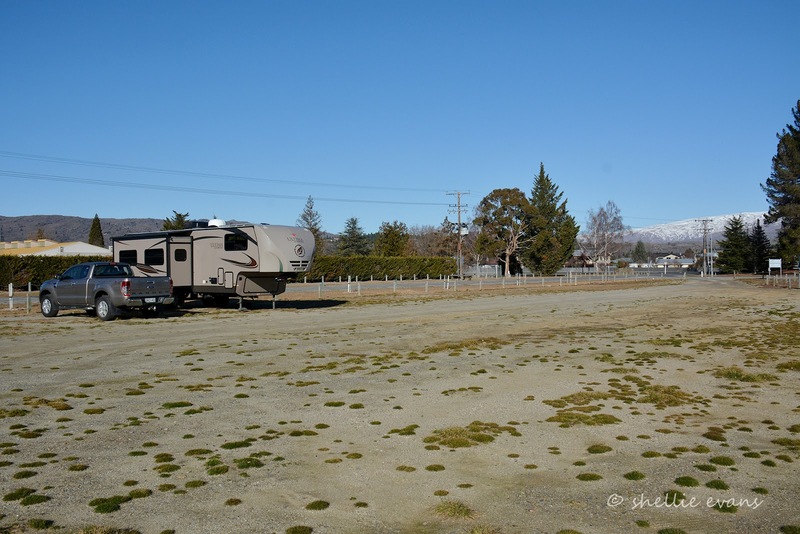 There are a couple of freedom camping areas nearby, one is by the river, but we decided we'd like the security of parking here while we explore the area. And it’s been great to head over to the pub most evenings to have a drink with the locals and it's where we’ve also had dinner, three out of four nights! A good solid country pub with friendly locals and great food- something we really enjoy and look forward to finding on our travels. Beside us and part of the hotel are the McKinnon Stables built in 1880 to house the hotel owners horses when he farmed the surrounding land (it’s also where Speights filmed their “Good on ya mate” adverts), The stables have been restored and are now used for weddings receptions and other functions. 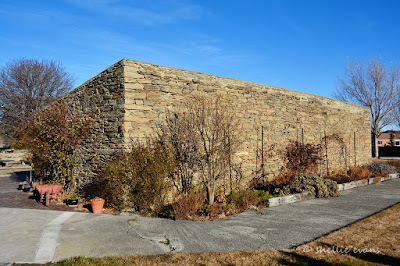 This is the back wall of the stables, I’ve been getting up too late to catch the sun on the inside! With the surrounding dry landscape and mud-brick cottages and buildings about, the area reminds me very much of the French villages around Provence. The ‘blink and you’ll miss it’ main street of Omakau. A couple of the old commercial buildings have been restored and now provide accommodation for cyclists. I don’t have a photo of the one we were very impressed with and would highly recommend (I will try for a photo tomorrow and post it here later). 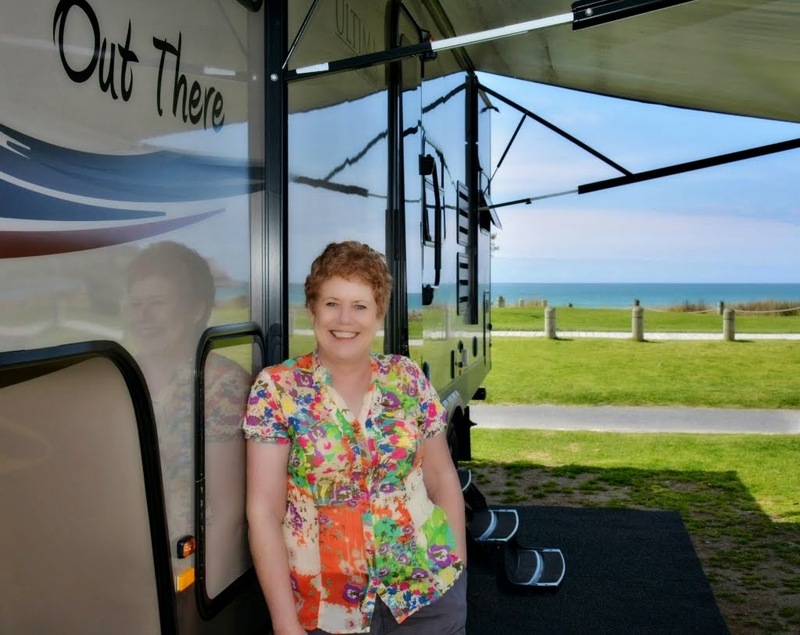 Mandy, the owner of Omakau Accommodation Cottage & Studio Units was doing some maintenance when we were walking past and invited us in to see the units. I’ve found some churches in some pretty unusual places but Omakau’s St Peters Catholic Church has got to beat them all- perched in all it’s glory & faded grandeur on top a nearby hill over-looking the town with the now, rented out clergy house, beside it and cows on the front lawn! Services are still held in the church every Sunday evening. 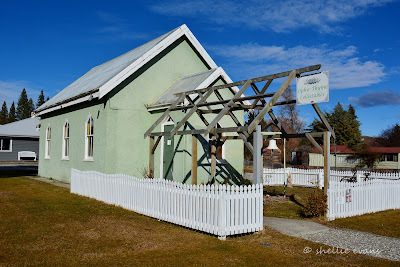 Another country town that has proven my previous thoughts, that only the Bank of New Zealand & the Catholic Church had money early last century. I took a drive exploring the nearby country lanes and came across the sheep in the bottom two photos, they were winter feeding on a paddock full of swedes. The nibbled tops of the swedes made an interesting pattern across the paddock, the sheep weren’t that keen on me stopping to take their photo and soon disappeared stage right. 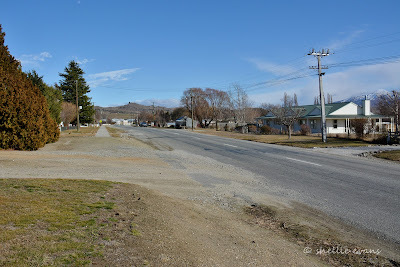 In contrast are the top two photos which I took while we were in Winton. 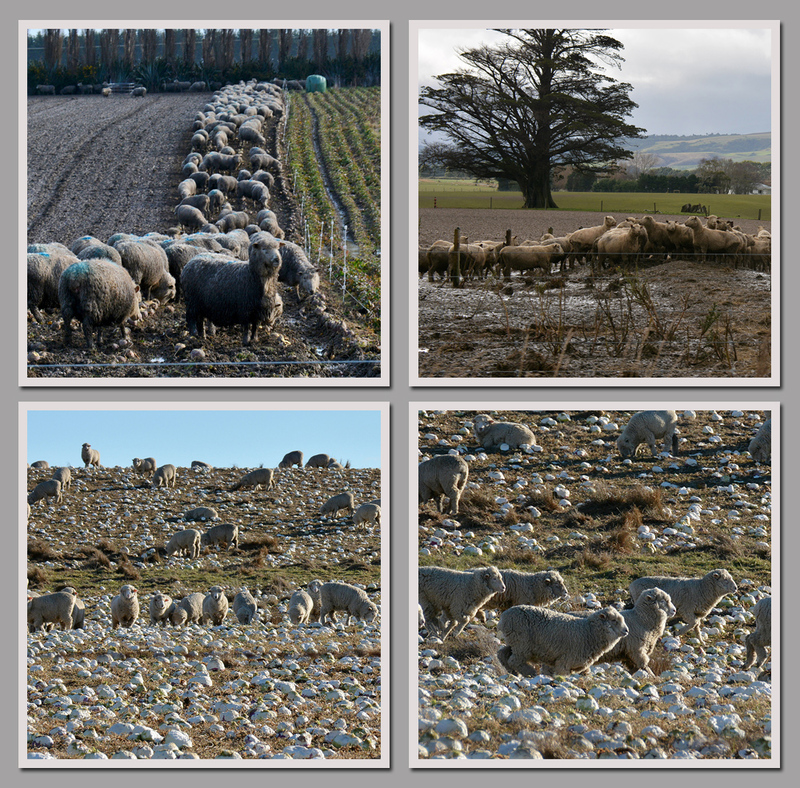 The sheep and cows in Southland are break fed during the winter in some of the most appalling conditions (I'm sure there are other areas in the country that are similar but I've noticed it more so in Southland during the last two winters). Each paddock of winter feed is drip fed to the stock in narrow fenced off sections called breaks. 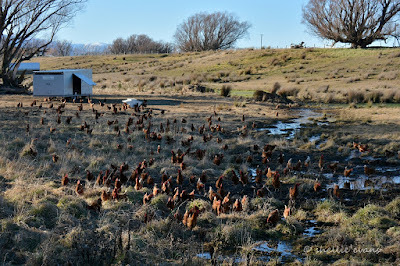 It’s usually very wet over winter and the paddock soon become a muddy bog. The poor sheep are weighed down by all the mud on their wool and the cattle are mostly standing in mud up to their knees, and for days on end. There’s nowhere to lay down and rest and sometimes I saw animals resting on the hay they were meant to be eating, often there was no reasonable shelter either. I’m no farmer and I know just about every Southland farm looked the same and I’m sure animal welfare is a priority but I know I wasn’t comfortable seeing the state of some of the stock, especially the cows. 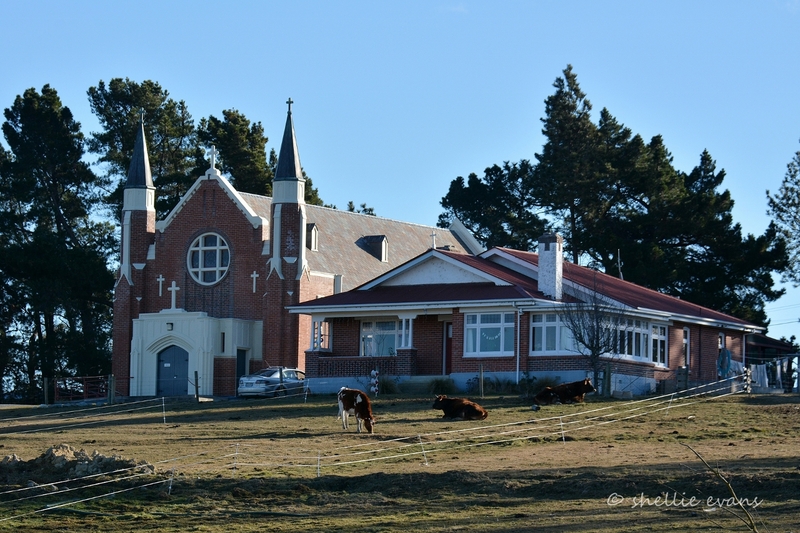 Too much intensive farming and dairy conversions? I don’t know. On a lighter note I also found this paddock of free-range chooks (chickens) on the outskirts of Omakau and unlike the shy sheep who ran off, as soon as I pulled up, they all came running as fast as they could towards me from over near the shed. I assume they thought I had dinner. Our next stop was a short 9kms down the road in Alexandra, where we parked up for two nights at Molyneux Park, a NZMCA POP. There’s a three night maximum stay and only eight vehicles at a time, are allowed to park over but we had the place to ourselves except for one vehicle who arrived late and left early on the last night. A little different to the last time we passed through Alexandra when we called into check the site out and it was full. Molyneux Park contains Alex’s sports fields and buildings which are used for a range of sports from rugby, soccer, cricket to judo and squash, it also contains the aquatic centre, a skateboard bowl and an ice rink. David enjoyed having a spa, and swim in the heated pool, at the Aquatic centre. Other than Saturday morning the place was pretty quiet (a hint for fellow campers- don't park near the skateboard bowl where kids now ride their bikes). On Saturday there was a steady stream of vehicles moving up and down the road delivering children to their Saturday morning sports, most seemed to be running late to get somewhere, hitting the speed humps with a good thump. The park is also very handy to town with the supermarket just down the road. An ideal place to stop and do all the chores except for the lack of an easy access dump station in town. Try filling up with petrol (for generator), diesel (for heater & ute), water for house tank and dump the three house waste tanks on the forecourt of a busy Caltex service station on a Saturday morning. Dumping right beside the drive through carwash is very off-putting, both for us and the people waiting in their cars in the queue. And I can imagine Subway just behind the dumping vehicles gets a few unpleasant smells when the wind is blowing the wrong way! Busloads of children arrived and departed from the ice rink during the day. An ice rink is another novelty for me, this is the first outdoor ice rink I have seen. I learnt to roller skate on a concrete rink, that’s all we had in Napier. The Marine Parade rink was my ‘hang-out’ place when I was a teen. 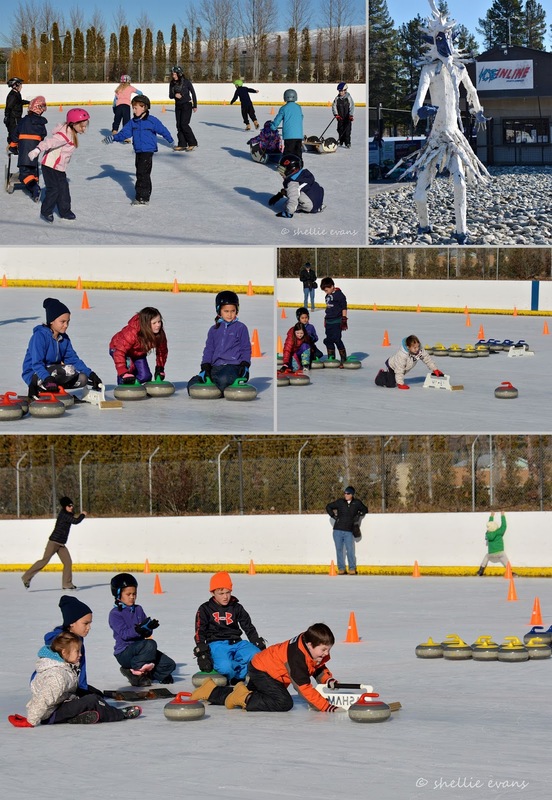 How cool that the local children learn to ice skate and curl as part of their winter school curriculum, a skill they’ll have for life. I love the penguin sledges which help them with their balance as they learn, I wonder if they have bigger versions for adults..... Don’t you love that little guy's helmet. And going by his skating skills I don't think he'll be keen to give the sledge away anytime soon. He knew what he was doing, racing fast everywhere and knocking a few kids off their feet along the way. His helmet matched his character for sure. I’m not sure whether the rather large scary looking wooden sculpture near the front gate entices the little kids in, I saw a couple giving him a wide berth. It was interesting watching the kids curl, those white ‘things’ are for balance instead of the brooms the big boys use. Check out the small child in the background on the bottom photo, hanging onto the wall for dear life- I think that’d be me if I tried to give it a go. Ice skating is a lot harder than roller skating. 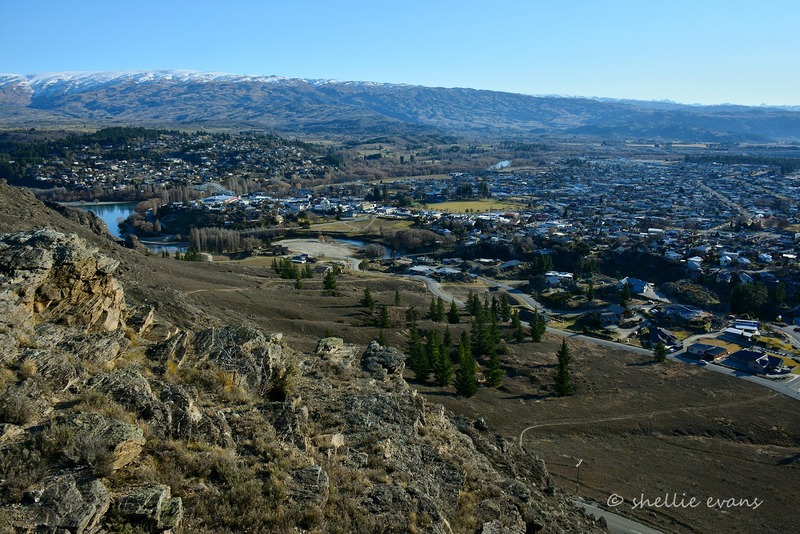 Before we left Alexandra, I took a drive up to the lookout, that’s the Clutha River along the back and the Manuherikia River in the foreground, their junction is at the top left near the steel truss arch bridge over the Clutha. The town centre is on the point on the inside of the rivers. 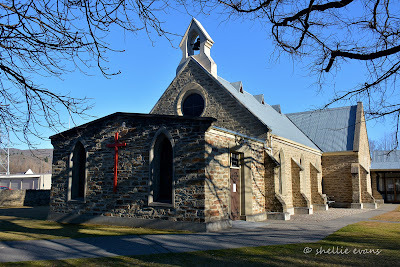 It was late in the afternoon but I managed to take a few church photos- this is St Enochs Union Church built in 1877. 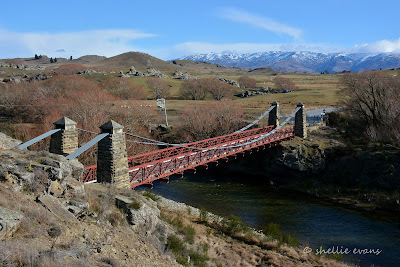 And I found ‘Shaky Bridge’, an historic suspension bridge built over the Manuherikia River. Before the bridge was built the only way across the river was by punt, the bridge was also used by wagons and horses however today the bridge is strictly for pedestrians only. The bridge opened in 1879 at a cost of £974 and was later sold for £1 to two settlers living across the river. The bridge fell into a state of neglect but was eventually repaired, it was at this time the bridge was narrowed to foot traffic only. And across the bridge I also found a great little cafe, aptly name Shaky Bridge Cafe which is part of the Shaky Bridge Vineyard next door. I bet this place is busy during the weekend and over the summer, there were many walkers, cyclists and runners crossing the bridge on their circuits even while I was there. We’ll have to stop there the next time we are in town. 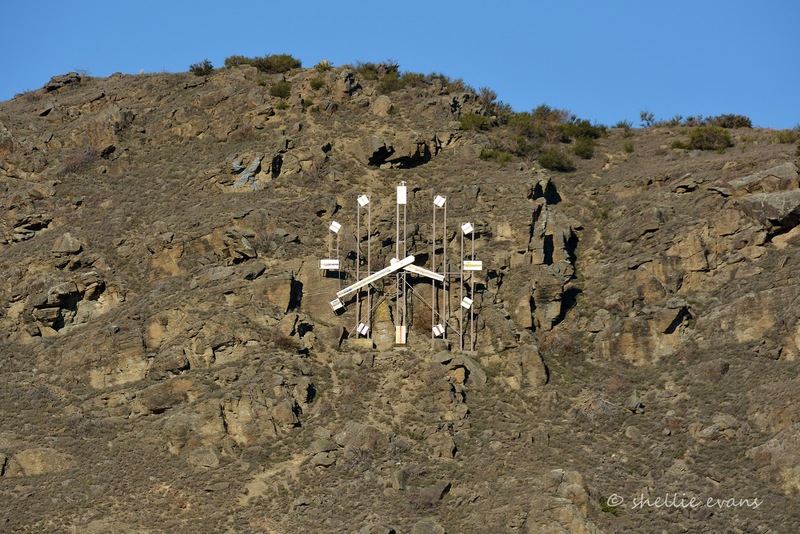 Minute Hand: 5.6m including the counterweight. Hour Hand: 4m including the counterweight. Weight: Each hand weighs approximately 270kg. The driving mechanism weighs approximately 760kg. Mechanism: Reduction gearboxes powered by one 3/4 hp synchronous motor. Lighting: 150 torch bulbs, powered by a reduction transformer. Structure: Six vertical steel columns averaging 7.3m in length, supported on concrete foundations, fastened into the rock face with steel supports. Location: On the Knobbies Range to the east of Alexandra. And one last photo, of the historic Vallance Cottage which was built in the late 1880s and lived in until the 1970s when there was still no running water inside and only cold running water in the separate wash-house. I didn’t check, but apparently the back door step is almost level with the ground due to the lady of the house being a “fastidious housekeeper” who scrubbed it daily. 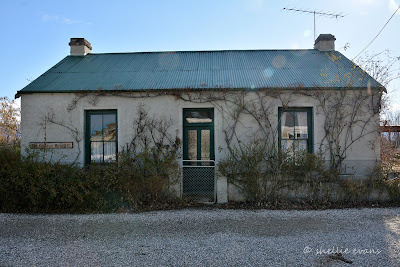 This tiny two bedroom mudbrick cottage was the home of William & Jean Vallance and their nine children. Nine children!! 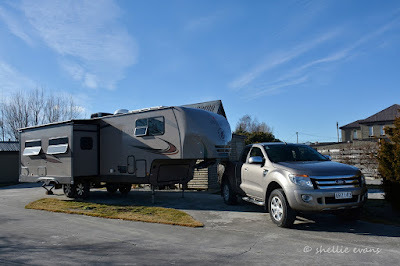 We’ve not done much exercise in the last couple of months, we've been blobbing it a bit, both because of the cold and the fact we’ve been enjoying just being parked up and relaxing with the family. 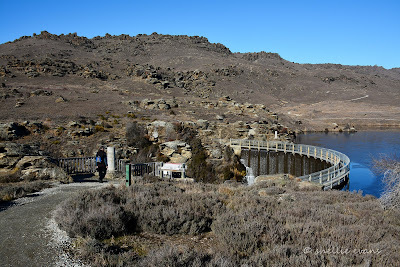 So I was thinking we’d ease back into it, it was such a lovely day we’d walk the Butchers Dam Loop, an hour long walk at the back of the dam that took you a little higher up the hill so we could see the whole lake. 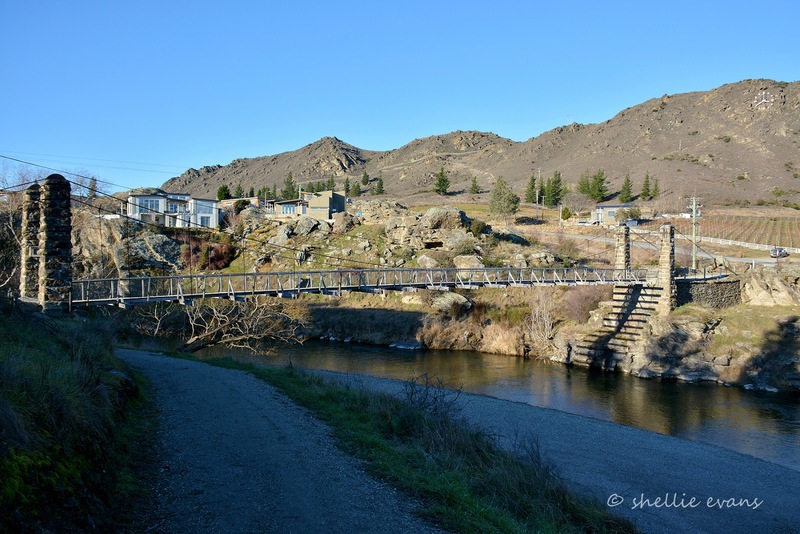 I mentioned that I’d love to walk to the top though, because I was sure that we’d be able to see the Clutha River Gorge over the other side. So it was a nice surprise when David said “Let’s go!, we'll walk to the top” So we set off along the Basin View track which initially followed a 4WD track west along the base of the hill, slowly climbing. 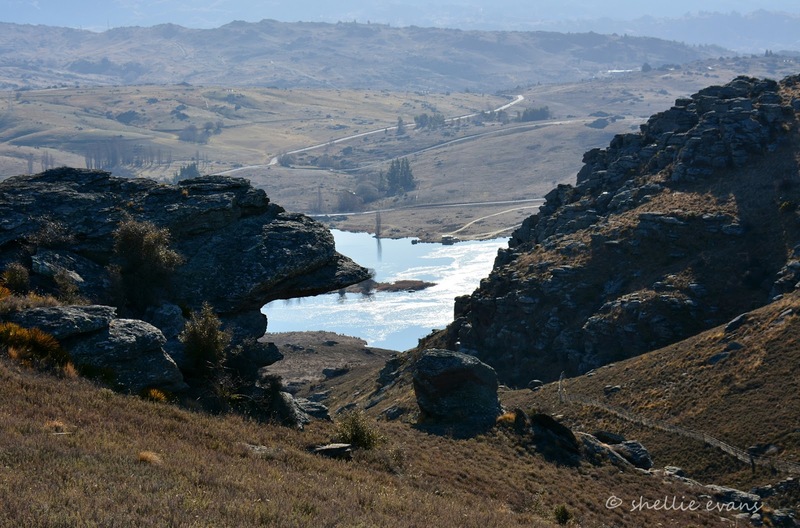 Looking back we could see the dam wall and the lake with ‘Out There’, way over the other side. We got a bit of a fright when we saw a car pull up beside the van, it’s an awful feeling seeing someone near your vehicles and knowing that there was nothing we could do if they had ill intent on their minds. We breathed a sigh of relief when they walked off after awhile, with a dog bounding ahead of them. I don’t know why we got a fright, we leave the vehicles all the time and have never had an issue. I think it was because we could see them. 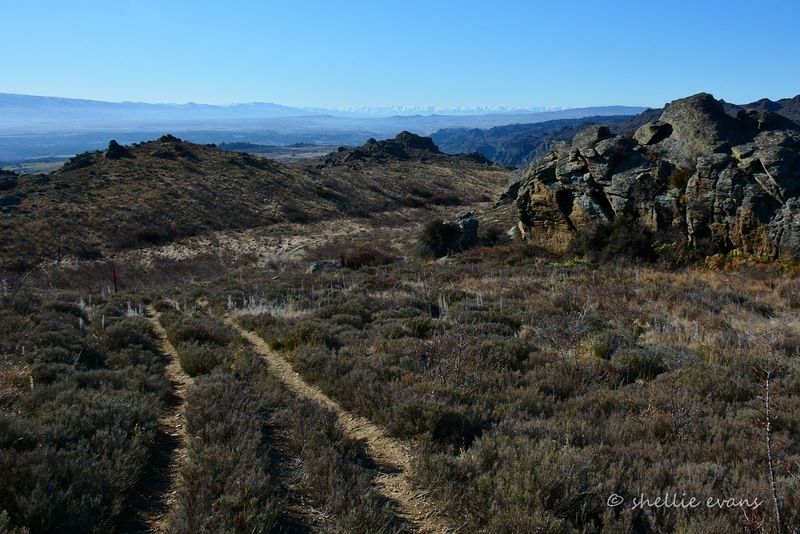 The 4WD track wound it’s way in and out of the gullies and seemed to go on forever, around every bend we thought we’d turn to start the climb up the ridge. In the end David decided a short cut was in order. 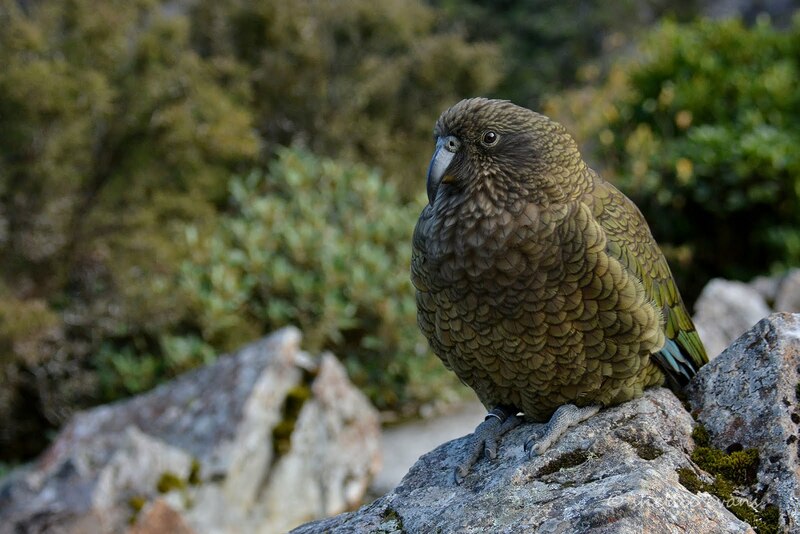 Especially when he saw a line of sparsely placed small white pegs with a tiny blue ribbon attached, weaving their way up the side of the hill beside us. After a bit of a discussion and a check of his tracking app, we decided to follow the white pegs and cut off the corner of the hill. I don’t know what the pegs were for, perhaps for a yet to be cleared mountain bike track (mountain biking has only recently been given permission to form tracks over the hill), or an orienteering course or maybe a cross country race, but we carefully followed them up the hill, around and through the many rock piles and over the dried thyme which gave out a fragrant smell as we disturbed it. For a non-native plant it’s certainly made itself at home, it covers nearly every inch of space for as far as the eye can see. 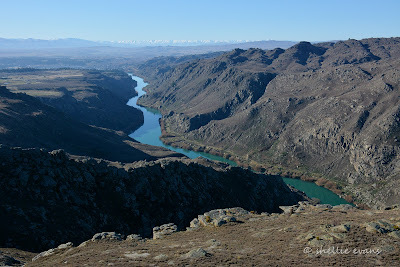 We’re climbing higher and the dam is getting smaller and our van is still in view…with no cars parked nearby. 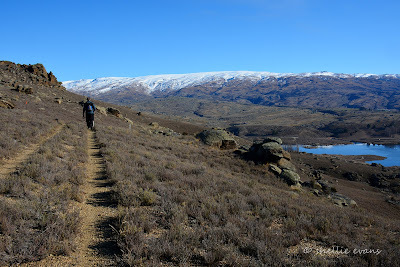 After the initial steep climb the ground levels out a little, the white pegs disappear and we’re still not back on the main track with the DOC orange marker poles to lead the way. I spot a white stick with no blue ribbon far up to the left but David thinks we should go to the right (which is the way we'll be heading when we do find the top- he's keen to shorten this walk some more). 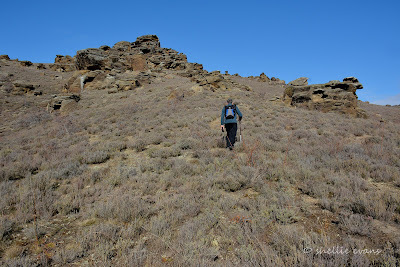 We beg to disagree and he heads off on his own to the right, I head to the left and pick up the peg trail again just below the outcrop of rocks on the left ridge. We weren’t too concerned as either way we had to reach the top of the hill and the track soon- anyway I wasn’t going to starve, I had the food, all he had was my tripod and a thermos of hot water! 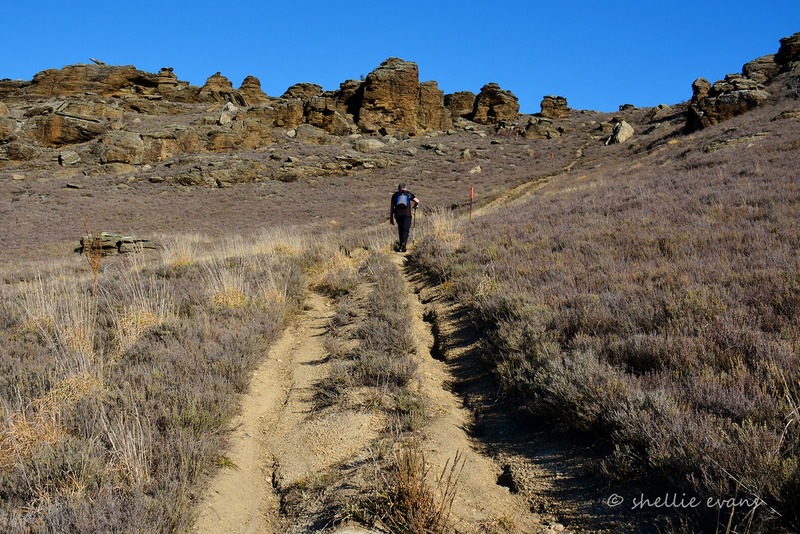 But seriously, I can see how people get lost out tramping in groups, especially if they disagree with a direction and head off on their own course. 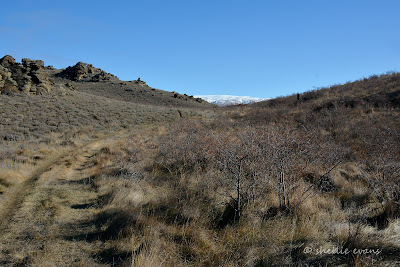 I made it to the DOC track first but had to walk further, as I came around a peak I could see David ahead of me, beating his way through the briar bushes. 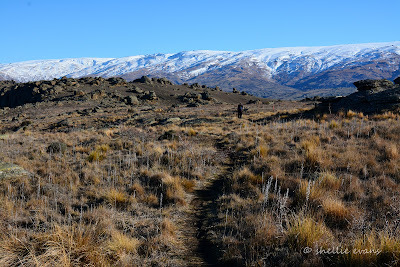 We were finally on the track and heading for the top, I turned around to check out the view to the north, towards the Maniototo, where we’ll be heading next. 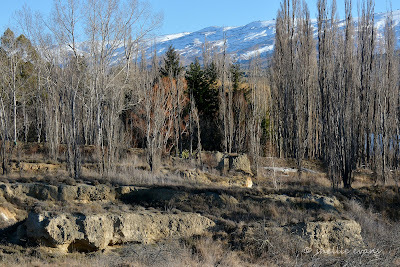 Far off in the distance are the snow covered Southern Alps. It’s a bit hazy, a photographer I spoke to at the dam earlier in the day told me there was a big burn off on one of the stations and the whole valley was covered in a smoky haze. We found a view to die for and a large flat rock to sit on to have our lunch before the last final push to the top of Flat Top Hill. 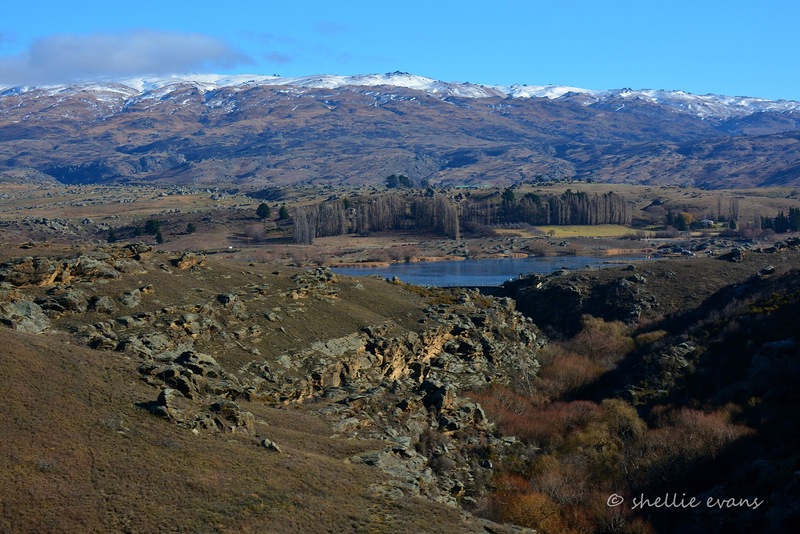 SH8 (Roxburgh to Alexandra section) can be seen running along behind the lake and up behind is the snow covered Old Man Range. No wonder this walk is called the Basin View. …before we pass a vehicle track that heads off back down to the lake and David is tempted to take it when he sees how steep the last section to the top is. I tell him there’s no way I’m taking. 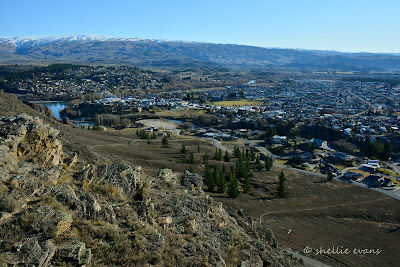 After coming this far, I want to see if the Clutha River is on view when we get to the top. He decides to stick with me. It’s a tough haul up the rutted track, not least because it’s turned into a bloody hot day and we have winter clothing on. 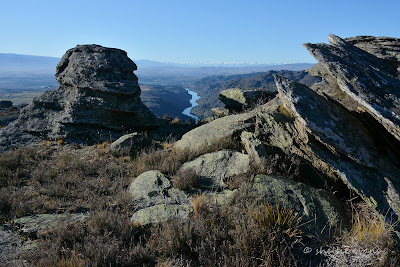 Finally we are rewarded, the Clutha River snaking it’s way down the gorge from Alex. I’d love to see this view in the autumn when all those willows along the banks would be in their autumn colours and the river a brilliant turquoise. 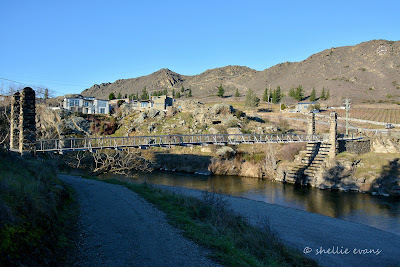 That’s a walking track along the other side of the river and part of the Clutha Gold cycle track runs along this side of the gorge in the shadow. 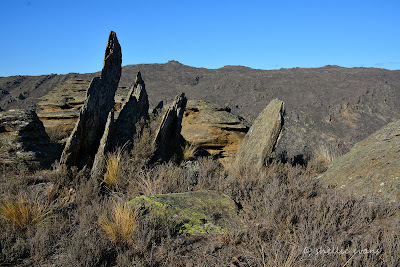 There are some amazing rock formations all over the hill, from stacked rounds of schisk piled on top of each other to slivers that look to have been pushed sideways. 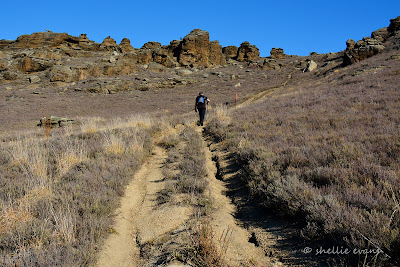 The track passes close by a rocky outcrop that drops away into the gorge below. It’s a pity we left our run a bit late and the sun is leaving the riverbed. 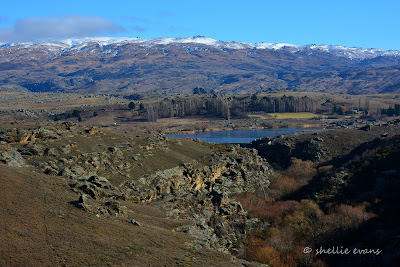 This is looking east towards Roxburgh, the cycle trail can be seen more clearly in this shot. It may not look like it but it’s a very long way down there, I doubt you’d see more than a black dot on the path if anyone was passing by. I wonder how the rock finds its way to sticking up like this. 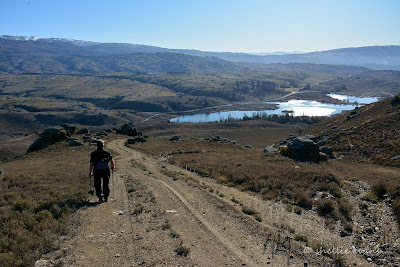 David’s getting weary, and impatient to find the track back to the dam, he leaves me in his wake. Which isn’t hard when I keep stopping to take photos. 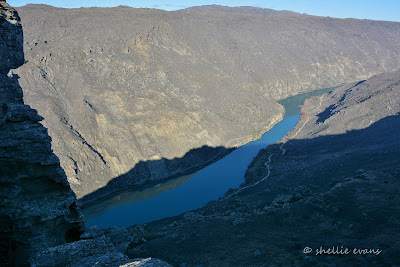 We pass a cutting in the rocks and can see straight down to the lake….and our van again. I’ve zoomed in quite a bit here. 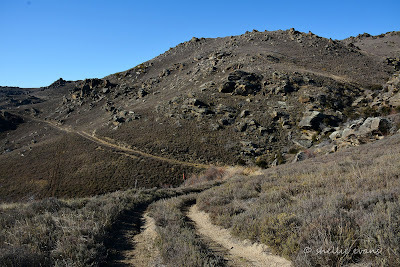 There’s no way down through this section, we have to carry on along the ridge. Finally we find a road going virtually straight down, we can see another sign a few hundred metres further on and looking through the binoculars and checking the tracking app we see that it’s the walking track to the bottom but it wends its way back and forth down the steep hill taking all the steepness out of it but probably doubling the distance to walk. We decide the Haul Road will do us so off we head, down some very steep sections, we skid on the loose gravel and try not to let our feet get away on us. 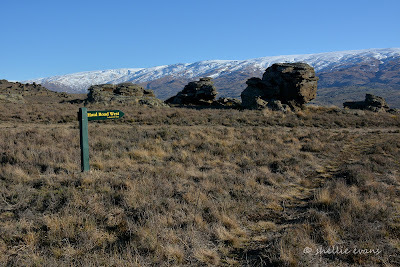 By about half way our toe tips and knees are complaining, it reminds me of walking down the Key Summit track on the Milford Road. It took forever to reach the bottom, and even then we took a short cut when the track headed off in the opposite direction before reappearing at the base of the hill. Six kilometres and three and a half hours later we arrive at the lake edge and head for home passing the remains of Lye Bow, the Chinese gentleman’s cob cottage on the way (see the previous blog for details). Maybe next time David will listen to me when I say we’ll ease our way back into walking. The Flat Top Hill Conservation Area consists of 813 ha purchased by DOC in 1992. 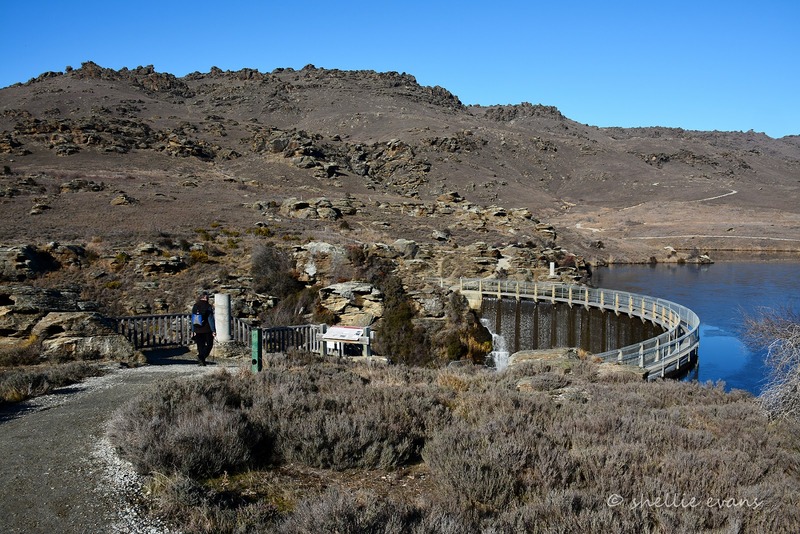 Situated behind Butchers Dam, it encompasses the northern end of Flat Top Hill running north to south, bounded by Lake Roxburgh in the east and Butchers Creek and State Highway 8 in the west. 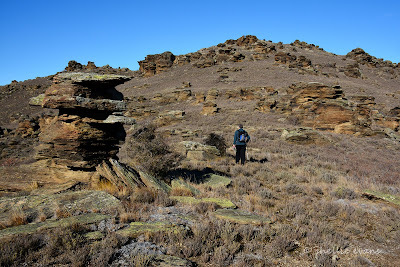 Flat Top Hill is a miniature block mountain, at the foot of the Old Man Range (Kopuwai). A dry land ecosystem, Flat Top Hill supports a diverse range of animal and plant life, including examples of regenerating native plant species that previously covered much of the lowland valleys of Central Otago. Dry land ecosystems are one of New Zealand’s most threatened ecosystems. 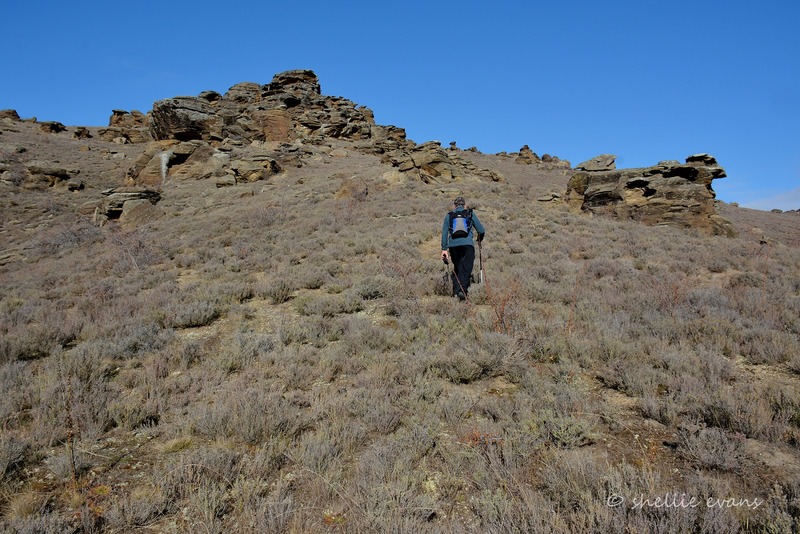 Flat Top Hill is important for observation, recording and management of such ecosystems. 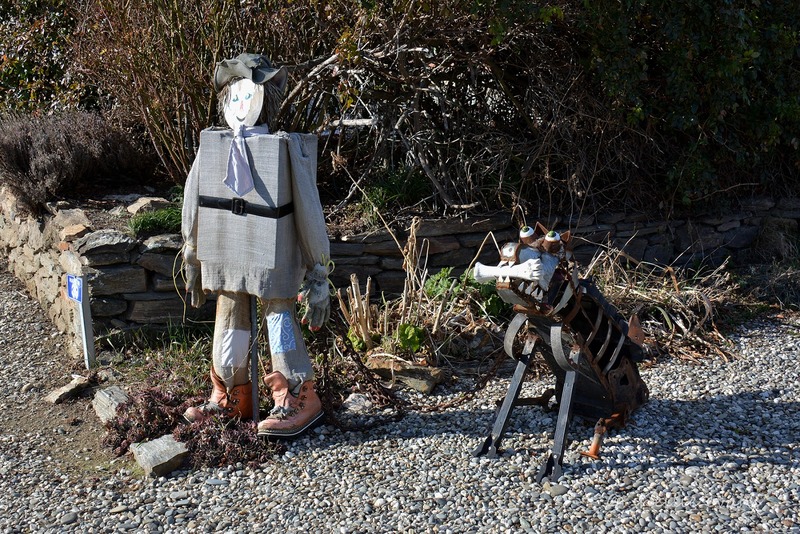 The area also includes some interesting historical evidence of European and Chinese settlement. It's Still Snowing in Winton!